Tag line: "It's about that favorite show you forgot you loved ... "
I’ve mentioned before how, back in the ‘70s, I used to watch a local Philly program titled Dr. Shock's Mad Theater (which, depending on when it aired, was sometimes known as Dr. Shock's Horror Theater). Played by Joe Zawislak, Dr. Shock would put on a skit or two, perform a few magic tricks, and then introduce that afternoon’s movie (usually a z-grade horror flick). I loved watching his show, and always got as big a kick out of Dr. Shock’s antics as I did the movies themselves. American Scary, a 2006 documentary directed by John E. Hudgens, takes a look at this particular brand of entertainment, which, by all accounts, is a tradition as old as television itself. American Scary starts at the beginning (in this case, the 1950s and ‘60s), when horror hosts such as Vampira (Maila Nurmi) in Los Angeles, Zacherley (John Zacherle) in New York, and Ghoulardi (Ernie Anderson) in Cleveland scared the pants off of kids while at the same time introducing them to a slew of B movies they otherwise would have never seen. These three, and others like them, paved the way for hundreds of imitators, many of whom came into their own in the ‘70s and ‘80s, when the fad truly hit its stride. 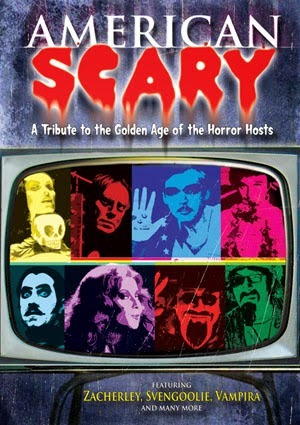 Along with exploring the history of Horror Hosts, American Scary spends a little time with the modern masters, guys like Dr. Gangrene (Larry Underwood) and Professor Anton Griffith (Joseph Fotinos), who, despite the fact network television has long since turned its back on horror hosts, are continuing this proud tradition on the internet. While I was a bit disappointed that American Scary failed to mention either Dr. Shock or his Mad Theater, it’s not a surprise he didn’t make the final cut. From the looks of it, every major city in America had their own horror host back in the ‘70s (some had more than one), making it near-impossible to cover all of them in a single movie (had the filmmakers attempted to do so, this documentary would have been 12 hours long). So, while American Scary isn’t all-inclusive, it does a good job filling us in on the history of horror hosting, while also reassuring us the phenomenon is alive and well.